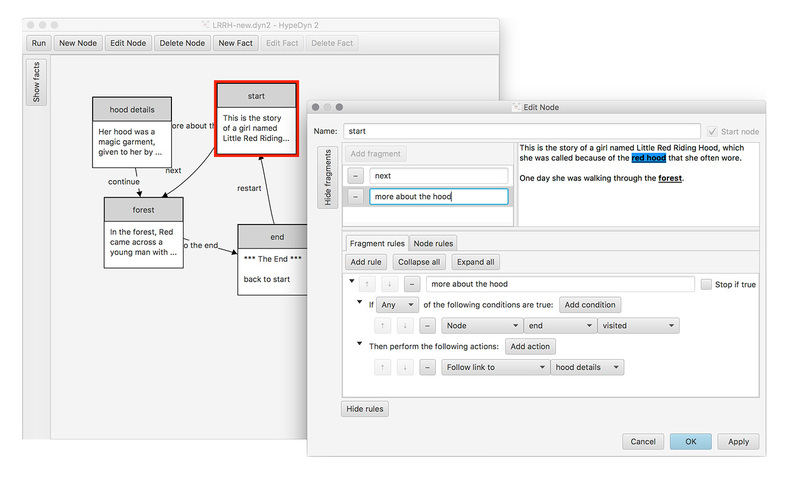 HypeDyn (pronounced "hyped in") is a procedural hypertext fiction authoring tool for people who want to create text-based interactive stories that adapt to reader choice. HypeDyn is free to download and open source, and runs on Linux, MacOS and Windows. HypeDyn 2 release 1.0.1 (Jan 2019) is available here. Experimental theme-based version from ICIDS 2016 is available here (MacOS X only). The final HypeDyn 1 release is available here. © 2008-2019 National University of Singapore. All rights reserved.